The Block Blob uploading is discussed here as Block Blobs are used for large file uploads. The associated code was developed to upload large files to Windows Azure Blob. The large file will be splitted into 4 MB chunks and then uploaded. The PutBlock method is called for each 4MB file chunk and PutBlockList method is called at the end passing the file chunk ids. On running the example, after opening and uploading an image file, you can see the following result. The first box shows the source image. 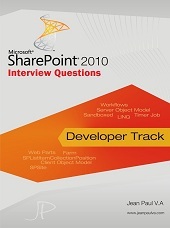 The second box shows the uploaded image from Azure. In this article we have seen the usage of Block Blob upload as chunks. The source code can be used to upload large files to Azure Blob. The associated example can be downloaded along with this article. The utility method was verified with 100MB file upload and download. 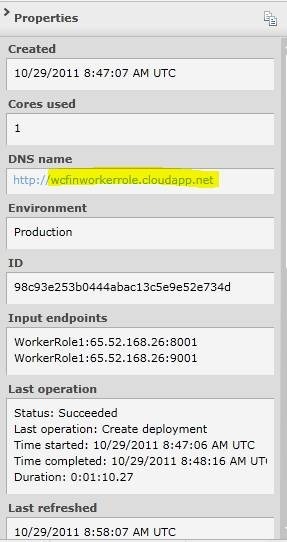 In this article I am going to demonstrate the creation of WCF service in Worker Role and deployment to the cloud. Following are the steps involved. 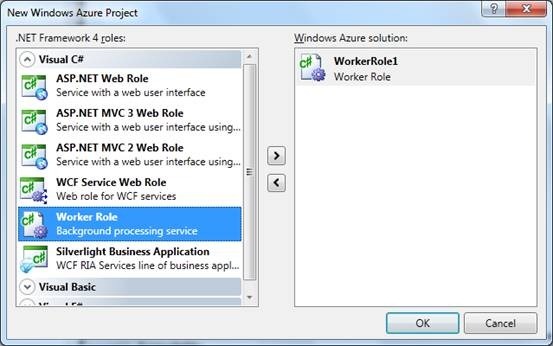 In the appearing dialog add one Worker Role project as shown below. Add reference to the System.ServiceModel assembly. In the case of web role, the context and port was automatically identified. But in the worker role, we need to update the properties manually. 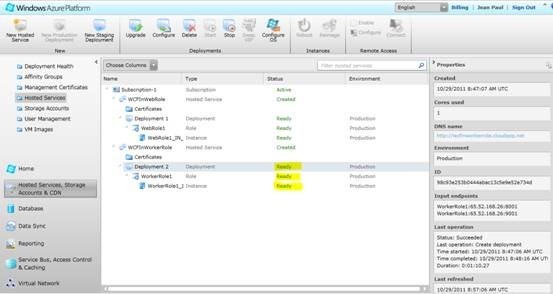 The host name will be different in the development and deployment servers. 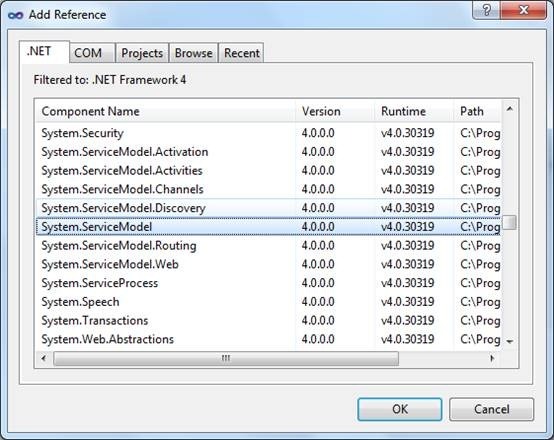 Modify the ServiceDefinition.csdef file as below. 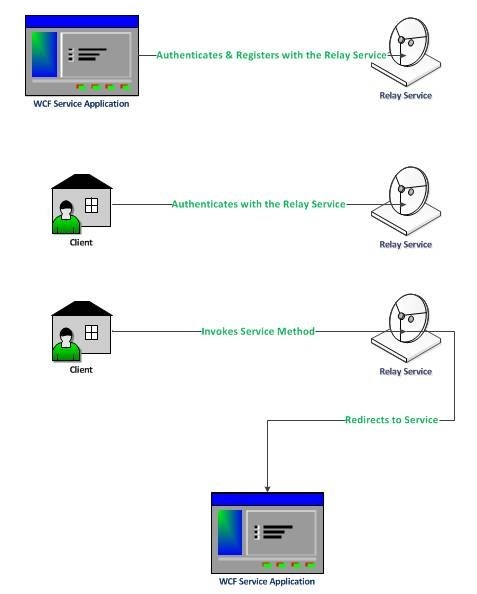 The content defines the port and metadata port for our WCF service. 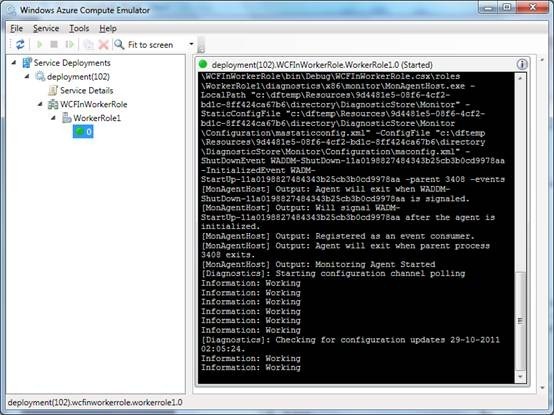 Now we can modify the OnStart() method of the Worker role class as given below. Note: The attached source code contains the working application. 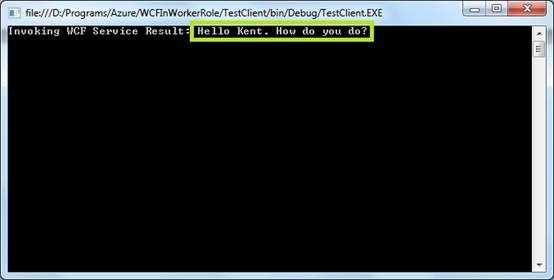 Now we can test the application by executing it. If successfully executed we can see the trace from the Output window. We can also see the trace from the load development machine. 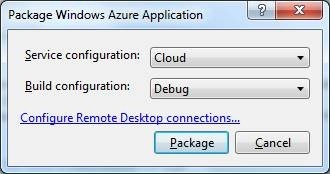 The Windows Azure Compute Emulator can be used for this purpose. 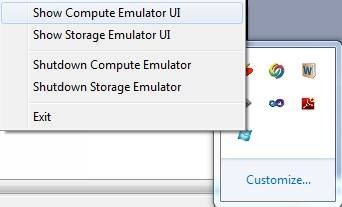 On invoking the Show Computer Emulator UI we can see the following window. The above window contains the same trace output with the end point urls. You may try adding reference to the metadata end point using the metadata url. We are going to deploy the service to cloud and test it. Now our application is working fine and we can deploy it to the online cloud. For this right click on the project and click Package menu item. In the appearing dialog box, choose the default options and click the Package button. Now sign in to the Windows Azure portal and click on the New Hosted Service button from the top ribbon. In the appearing dialog box enter the details as shown below. 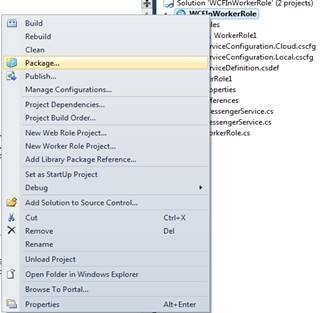 Locate the package and configuration files from your application bin folder. Please note that the URL prefix should be a unique name. If the URL prefix entered is already in use you need to change it. If any warning box appears, click Yes button to continue. Wait for a few minutes and your deployment will be ready in a few minutes as shown below. 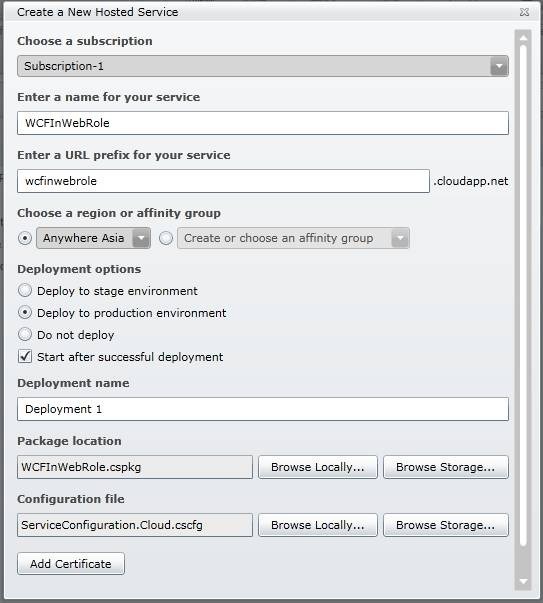 Now we are ready to create the client application and test the deployed online cloud WCF service. 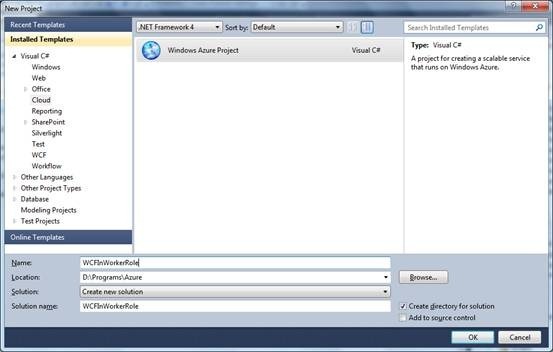 Create a new console application into the existing Azure project and name it as TestClient. 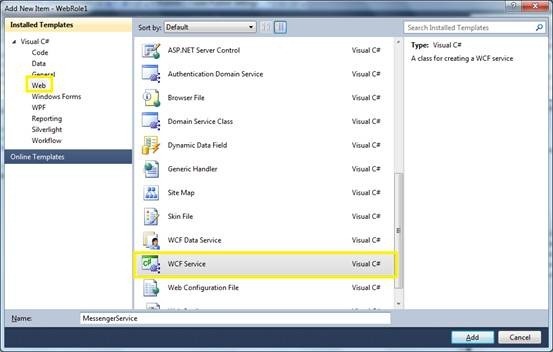 Use the add service reference option of the console application and in the appearing dialog enter the constructed service url as shown below. 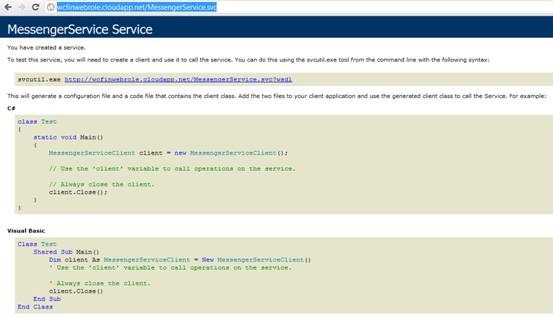 Click the Go button and after seeing the MessengerService item populated, Click the Ok button to continue. 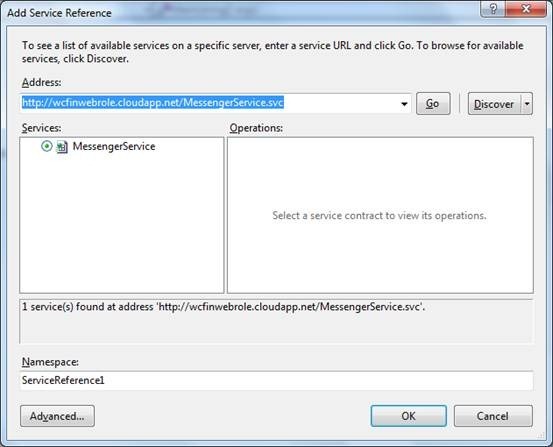 Modify the configuration file with the url of the Messenger Service. Please note that the messenger service url is having different port number and context. Now set the console application as the start project and execute the application. You can see the following results. You can see the result Hello Kent. How do you do? from the WCF service. 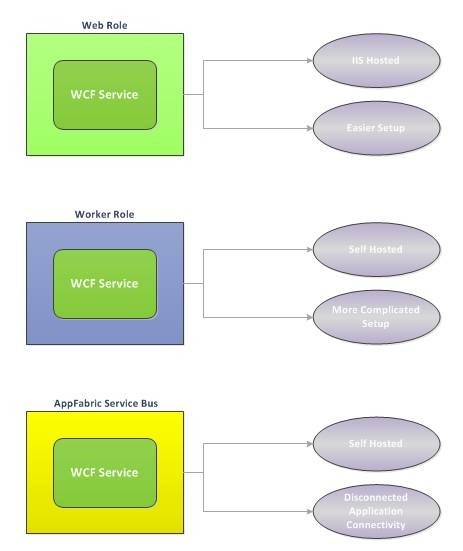 This concludes our article on WCF service deployment as worker role and the testing. I would like to add a note on the 2 end points we created for the WCF service. Note: WCF with HTTP Port 80 endpoint configuration done as explained here. 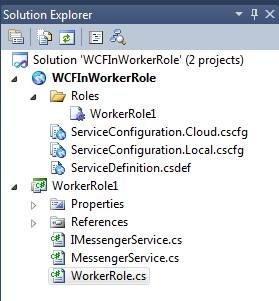 In this article, we have seen how to host a WCF service using the Worker Role and deploy it to the cloud. This service is self hosted and experiments the service creation, hosting, metadata end point adding, deploying and testing with the client. The source code is attached and the application name in the url has to be changed according to your application name. 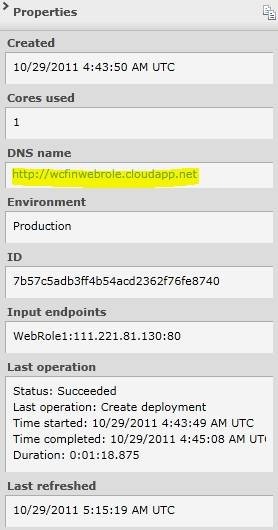 In this article I would like to demonstrate the creation and deployment of WCF service in a Web Role. 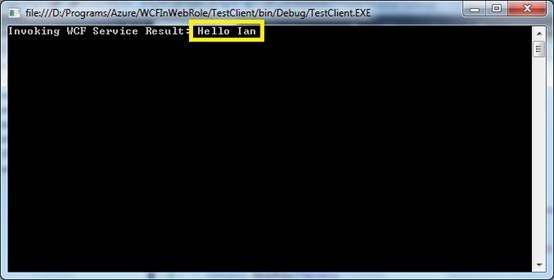 In the appearing dialog add one Web Role project as shown below. 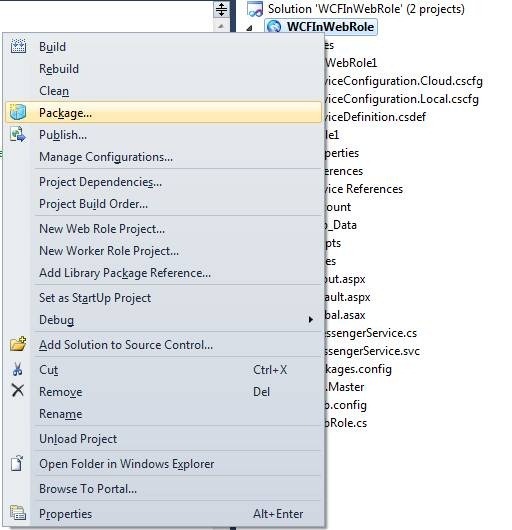 Add a new WCF Service into the project. Name it as MessengerService. Now the Solution Explore will look like below with the newly added contracts and service files. Modify the DoWork() method in the interface IMessengerService as given below. 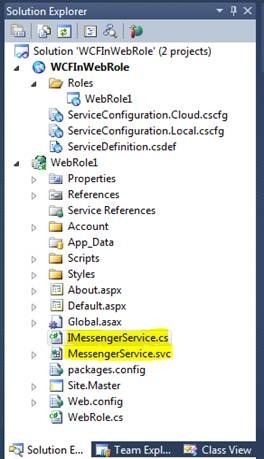 Make the MessengerService.svc file as the start page as shown below. Press F5 to execute the application and you can see the service opened in the browser as shown below. Now are have tested the application and it is ready to be deployed to the cloud. 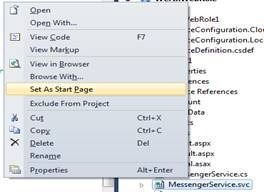 Right click on the Web Role project and click package menu item as shown below. In the appearing dialog select the default option and click the Package button. 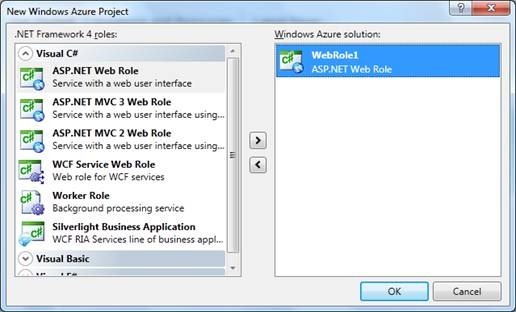 Select the Deployment 1 row and from the properties window you can get the url of the web role. Click on the url and your application will get opened in the browser. 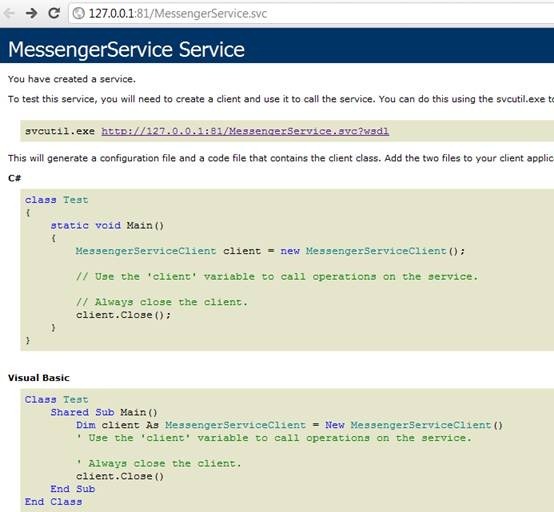 Add the suffix MessengerService.svc to get the messenger service. Use the add service reference option of the console application and in the appearing dialog enter the service url as shown below. You can see the result Hello Ian from the WCF service. 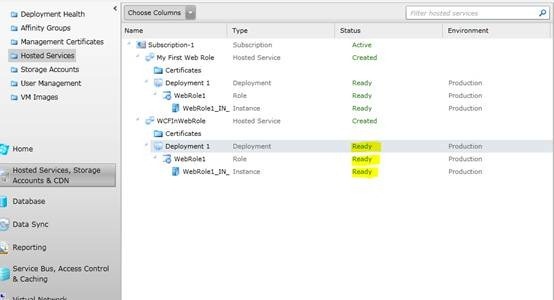 This concludes our article on WCF service deployment as web role and the testing. 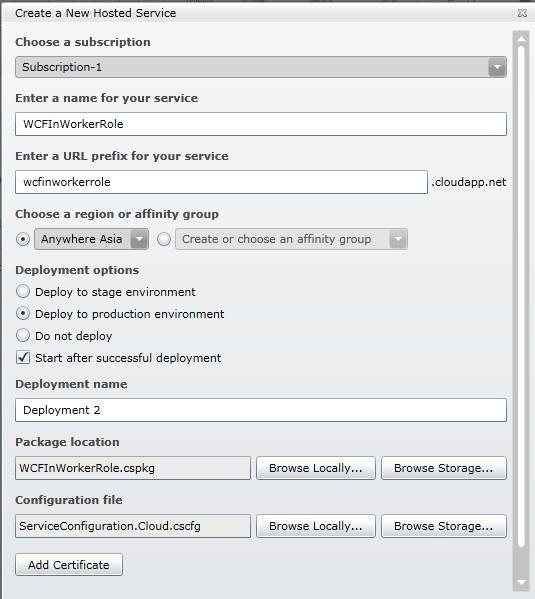 In this article we have seen how to deploy a WCF service to cloud platform. The WCF service inside the Web role will be hosted in IIS. The source code is attached and the application name in the url has to be changed according to your application name. Often in my consulting experience developers are needed of Low Level Design Document. This is a simple document created for that purpose. You are free to download and change it. Please let me know your feedback to improve the same. 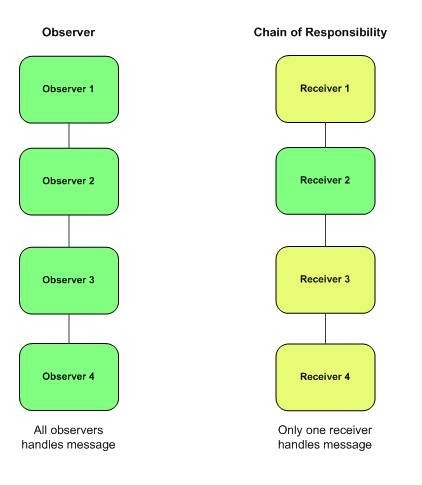 Chain of Responsibility is one among the 23 Design Patterns by Gang of Four. It is an interesting pattern and similar to Observer pattern. In this article we are exploring the Chain of Responsibility pattern. I am using the same Challenge and Solution style for explaining this pattern. 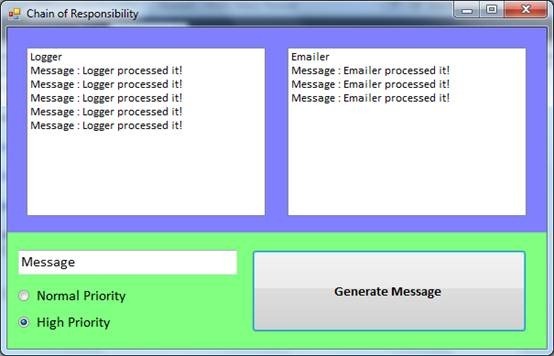 You are working on an application in which the Logic class generates various messages. The messages are of two types. The Normal Priority messages are to be processed by Logger class and High Priority messages by Emailer class. You have to make the design in such a way that the Logic class need not think about right handler of the message. It will just send the message. How the design will proceed? We can see from the above code that the Logic class has a property of type IReceiver. On the CreateMessage method this Receiver is used to handle the message. So only one receiver is registered by the Logic class instance. From the above code we can see that each receiver class checks the message priority and processes it. If the priority is not matching it is send to the next receiver in the chain. Here each receiver takes care of passing the unprocessed message. The next receiver is stored through the constructor of each receiver. 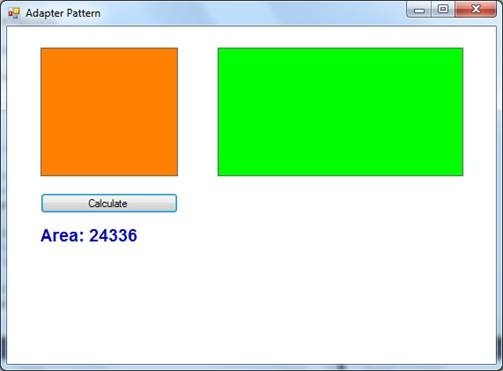 The windows forms application attached can be used to test the control flow. Note: Please note that the advantage of this pattern is decoupling of sender and receiver. The sender does not think about the right receiver. Instead it will pass the request and the appropriate receiver should process it. The above example can be written using a list of receivers in the Logic class with a Boolean property mentioning whether the message is processed or not. In the case of Observer pattern all the registered receivers will get the request. Each of the receivers is interested in processing it. But in chain of responsibility the request is passed until it is not processed. 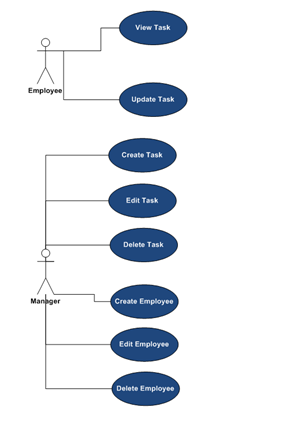 In this article we have explored Chain of Responsibility pattern with a C# example. The associated source code contains the example we discussed.